Dear little cottage nestled in native bush just South of Oamaru (25 minutes to Oamaru town with no traffic) in the Herbert Forest set on 30 acres of farm land. 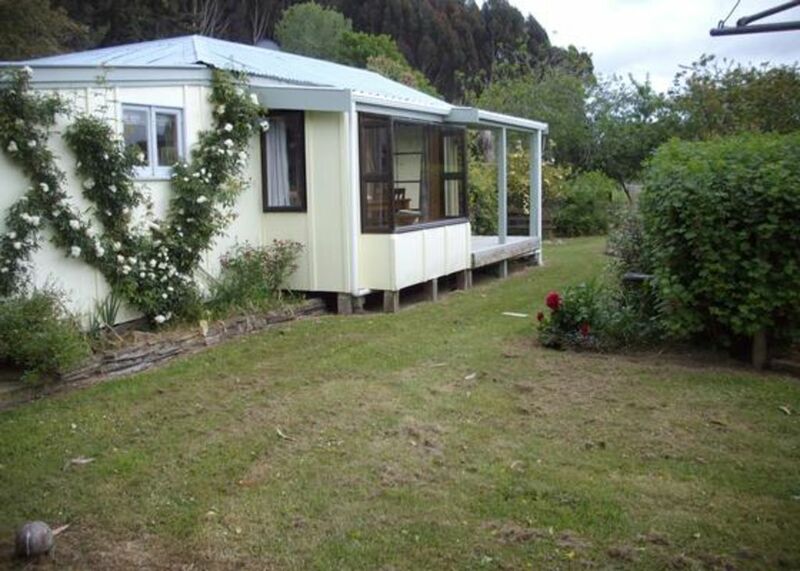 Only 15 minutes from Moeraki boat ramp, private, secluded, fully self contained and furnished. Two queen beds and 2 singles in three bedrooms (one a sleepout attached to the cottage). Also a portacot for the baby. Ideal for families or couples wanting complete privacy. The nearest house is 300 meters away! The river with ample swimming holes is only a short walk away and there are restaurants and pubs at Moeraki and Hampden. There is room for the boat or horse float and there is grazing available for horses at $10 per night per horse including hay if necessary. Great for those on a long trip and wanting to have a break with their horses. If there is anything you need the owners are up the hill and can provide. They also run a bed and breakfast in their new home, which also sleeps 6, so great for a big party of 12 on the same property. Tarriffs available on request. Travel South from Oamaru through Herbert and take the first right down the hill into Breakneck Road (right hand filter available) then go past Timber Mill and go across river and turn left into Reid Road. Take the second right drive ('Forest Hill' sign on drive) and the cottage is the left fork. From Dunedin 1 hour North take the first left after the Mill House motels into Breakneck Road. Horse floats and boats can be parked in the adjacent paddock just before the fork and adjacent to the cottage. The bush forest walks are outstanding and there is a new mountain bike track (right next door) in the bush. The beaches are only a short drive away. Moeraki Boulders being the big main attraction - we thoroughly recommend the restaurant there, only open for lunch. Fleurs Place is also at Moeraki Harbour, recommended by Rick Stein and should be booked in advance (lunch or dinner). Linen can be provided at extra cost and for a two night minimum stay. Thank you dear Lesley again for your hospitality and very easy way of communication. I’m very appreciated. We will see you you next year again. I walked in the door to find dead bugs on the table, no towels, half empty milk bottle in refrigerator, no linens. I walked out and stayed at a motel 2 hours away. This is complete rubbish. Towels are always on the beds and beds were made up. I cannot believe dead bugs on the table either, however, I cannot be responsible for the odd one coming in after the place has been cleaned. I did notice all the instructions all over the table so you did read the information about the cottage. We have next to no complaints so I will quite happily ignore this one. If you had looked at the milk bottle in the fridge, you would have noticed it had 'Fresh Milk' written on it. Yes, you would have had to stay a long way away because of the Eagles Concert. I have one question - why on earth did you not ring and ask me to come down and rectify what you thought was so awful? Both my numbers are in the information folder and you did not ring either of them. I will be in touch on my return home. Really enjoyed our time in this kiwi cottage. The area was a great place to explore with the kids. They especially loved the welcome we received from the chickens upon arrival. Thank you for your kind words we enjoyed having you! Thank you so much for reviewing our cottage. We appreciated reviews especially now that Homeaway are the new Bookabach. To you personally we enjoyed having you and I know Brian enjoyed meeting you during your stay. We hope you can consider staying again one day. Cosy and comfortable and a stunning setting. We had a swim in the water hole. Thank you for the Christmas tree - kids loved it.